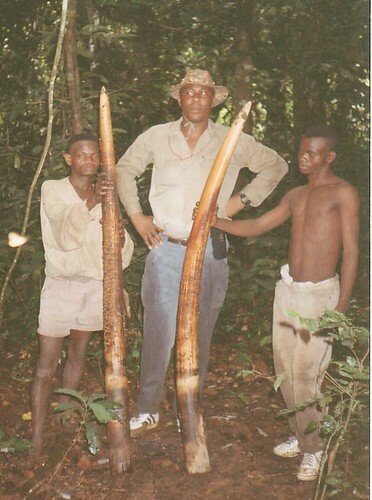 Ivory found in the Ituri Forest in the early 1990s. Paulin Tshikaya, over 6 feet tall, and warden of Garamba National Park is in the center. 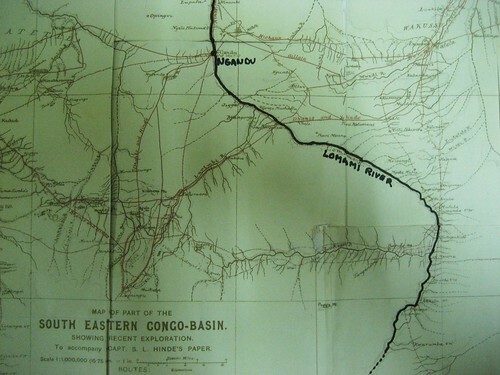 All hell broke loose on the Lomami River during the 1890s. It began east of the Lualaba in the 1860s, with the rise of the Arab ivory trade. 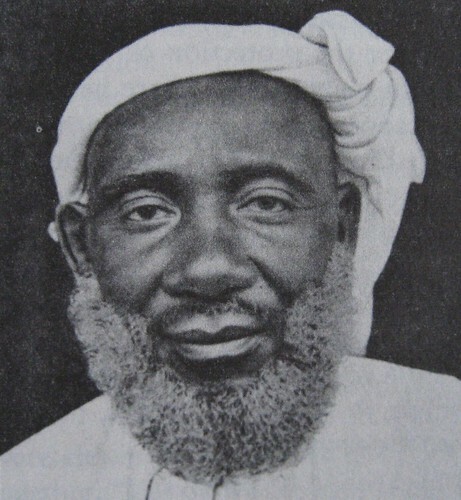 Tippo Tib from Zanzibar (where he started life as Hamed bin Muhammed el Murjebi ) carved out a Congolese Sultanate. Slaves hauled his ivory to the markets of Zanzibar often hefting a single tusk at over a 100 pounds. Tippo Tib, ivory merchant and slave trader, built a successful empire in eastern Congo. This picture first published in 1889, The Illustrated London News. His favorite slave, Ngongo Luteta, came to him as a young boy. Luteta was from the Batetela tribe that lives where the Lomami plunges from high savannah plateau, to forest islands and into unbroken forest. Ngongo Luteta rose fast and became a leader of Tippo Tib’s wanguaana (Arabized Congolese) warriors and the strategist who brought the most ivory and slaves back to his master. Tippu Tib was so pleased with the dashing Luteta, that he freed him when he was only 25 and sent him home to the Lomami. 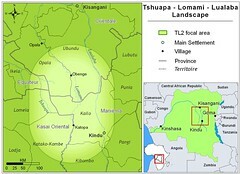 But Tippo Tib sent Ngongo Luteta with a clear mission: caravans of ivory must come east to him from the Lomami and the Tshuapa basins. Luteta was immensely successful. Great graves of elephant bone rotted in the forest duff, the ivory was carried east. The people of the Lomami who carried the ivory, were enslaved and their societies torn asunder by the firearms and cold determination of Ngongo Luteta. Ashley, 120 years later, when his dugout was not more than two days south of Opala , wrote “Not many people here. This forest is empty” . He repeated it all the way to the savanna. Were the massive slave campaigns initiated by Ngongo Luteta partly to blame? 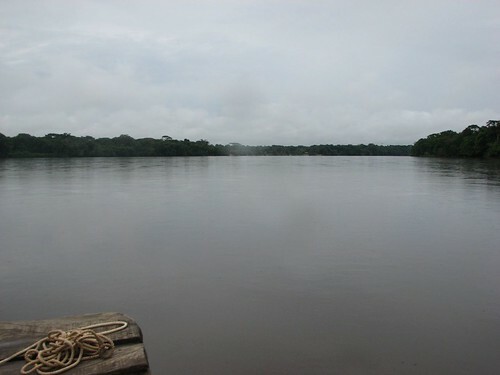 The Lomami River is depopulated here in the north and Ashley found fewer and fewer people as he moved up stream and deeper into the forest. Ngongo Luteta is hero and nemesis. He was a well-built, intelligent- looking man…with a brown skin, large brown eyes, very long lashes, …and a straight narrow nose. His hands were his most remarkable characteristic: curiously supple, with long narrow fingers. One or both hands were in constant movement, opening or shutting restlessly. His features meanwhile remained absolutely immovable. [Ngongo Luteta] hissed out his orders one after another without a moment’s hesitation. He was capable of sustaining intense fatigue, and would lead his warriors through the country at a run for hours together. Ivory was big money and the Europeans wanted it. Ngongo Luteta met the Belgians on the rivers of their new colony and realized he could make more profit trading his ivory to them. The Arab’s suzerainty was at stake. 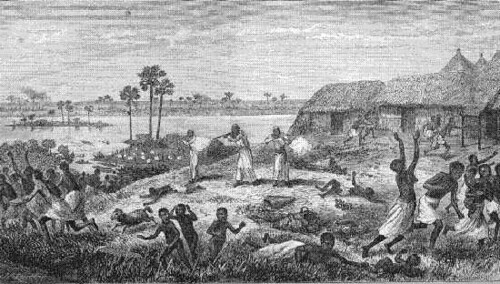 Tensions rose, a European ivory merchant who had set up two trading posts on the Lomami River, Arthur Hodister , was massacred with ten other whites and the Belgo-Arab wars began in earnest. Ngongo Luteta was fighting on the side of the Belgians and the Congo Free State. Although carrying an anti-slavery banner, there was no doubt that control of resources (importantly elephants) was central to the Belgian King, Leopold II. N’Gandu was a fortified town by the river-bank, with four gates, each approached by a very handsome pavement of human skulls, the bregma being the only part showing above ground. I counted more than 2000 skulls in the pavement of one gate alone. 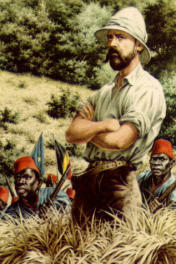 Francis Dhanis with his Belgian officers and fighting men were strengthened by Ngongo Luteta and 10,000 of his men. Together they marched on to meet the Arabs further east. Numerous times Ngongo Luteta’s courageous tactics pushed a battle to victory for the Belgians. In January 1894 the Belgians prevailed and central African trade routes no longer led to Zanzibar in the east but now the ivory and eventually the rubber, copper and gold all went out to the Atlantic on the west. At N’gandu, Ngongo Luteta’s home on the Lomami, on the 15th of September 1893, a Belgian army officer named Jean Scheerlinck independently decided that Ngongo Luteta was a traitor. Without consulting his superior, Francis Dhanis, he court-martialed Luteta, had him condemned to death, and put before a firing squad. Curious and sad what is excused by war. This entry was written by Terese Hart, posted on 2007-10-05 at 12:08 am, filed under Elephant, History of TL2. Bookmark the permalink. Follow any comments here with the RSS feed for this post. Post a comment or leave a trackback: Trackback URL. While it is a cliche to say that history is key to understanding any landscape, it is rare that one can discover a natural landscape of this size where the human imprint of a century ago is still so clearly evident. History will also play its role in defining just how this vast forest, without a doubt the last unknown area of this size remaining in DRC, will come into the 21st century. The fact that military-linked elephant hunting has penetrated deep into the Lomami Forest clearly has a precedent of over 100 years. How can that be changed– while the landscape still has its elephants? Fascinating stuff. I dimly recollect some of the details from (I think) the Scramble for Africa, Bury the Chains and King Leopold’s Ghost, but you’ve really brought this history to life. You’ve got me wondering what that area would look like today had the Arab traders fought off the Belgians. Hard to imagine– would the market forces have been a lot different?? …. but if the trade monopoly was maintained by the East, by Zanzibar, and if the same basic resources were sought after : rubber,copper, gold, uranium, diamonds; It would have changed a lot. One important handicap though: there is a water route to the Atlantic but not to the Indian Ocean.